Since the century began, astronomers have been discovering new planets around other starsexoplanets. This harvest of information has become a floodNASA's PlanetQuest site now lists more than 5000 exoplanets. Almost all of them are represented by "impurities" in a stream of starlight, no more than a single pixel in extent, registered by a telescope in outer space. Planetary scientist Nicolas Cowan explains in a new paper that we can learn a lot from those thousand points of light. Cowan, a researcher at Northwestern University, writes in the June 24 issue of Eos that the thin trickle of light from an exoplanet can be analyzed in surprising detail given what we know about planets in general. A big obstacle in studying exoplanets is dealing with the stars they orbitsuns like our own whose light may be a billion times brighter than the light from the exoplanet. There are mechanical ways to screen out the star that work in a few cases. 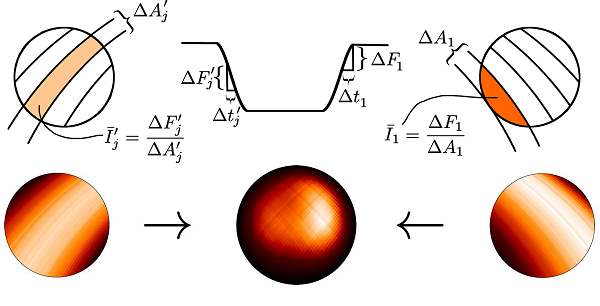 Outside that ideal situation, we can still use numerical methods to isolate the stream of photons of exoplanetary light from the flood of stellar photons. Think of the problem as a torrent of M&M candies, representing photons, pouring through a chute onto a table. Almost all of them are brownthat represents the star's lightand a few are other colors representing light from the exoplanet. Those colors are different because an exoplanet can change the starlight falling upon it. For example, Earth directly reflects more sunlight in blue than it does in red, and its outer atmosphere absorbs incoming light and re-emits it at other wavelengths (ultraviolet during the day and thermal infrared at night). The diagram above shows some of the possibilities raised by the orbit of an exoplanet. When it goes behind the star (in eclipse) its light is lost entirely, and when it goes in front (in transit) it partially blocks the star. This data is very handy for helping separate the two streams of light when they're mixed. As the exoplanet moves around its orbit, the mix of light it displays changes with time. In the gibbous phase, it reflects more light; in the crescent phase it displays more re-emitted light from the nightside. Over the course of the exoplanet's orbit, all of these differences show up in that single pixel of light. The single pixel can even be cracked open a bit. 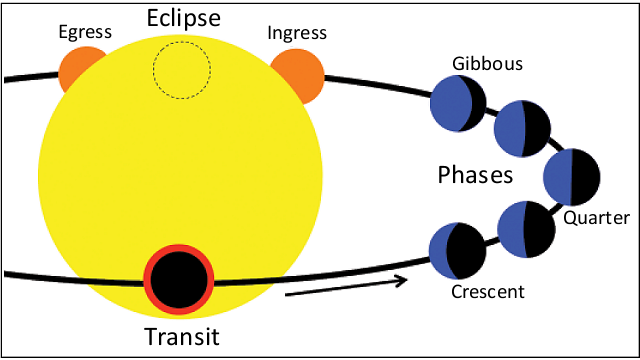 As the exoplanet enters and leaves eclipse, it becomes possible to derive crude maps, as shown below in another of Cowan's recent papers. And an exoplanet's rotation also offers a way into the pixel. The late Carl Sagan famously called Earth a "pale blue dot" after a picture taken in 1990 by the Voyager 1 spacecraft from the edge of the solar system. In that image, Earth was barely a pixel across. What could we deduce about Earth from that single pixel? In a 2013 paper in The Astrophysical Journal Letters, Cowan and Talia Strait analyzed a set of one-pixel snapshots of Earth taken during the Deep Impact space mission. The snapshots, taken once an hour for 24 hours, represent a complete Earth day. Using well-known techniques (principal-component analysis) and no foreknowledge, the authors were able to tell the rough proportions of land, water and clouds visible as the Earth turned. This proof-of-concept exercise can be refined for use on any object, not just exoplanets but small bodies in our own solar system or, I suppose, enemy satellites. Given enough observations, it could tell a rotating planet from a nonrotating one, even if the planet had weather. Techniques like these are already being used on exoplanets, although only a few dozen are represented so far. As the flood of new exoplanets continues, and as more of the smaller, Earth-sized bodies are documented, we will be able to pick out exoplanets like our own and bring the statistics of large numbers to bear on the question "How unusual is Earth?" As the answer to that emerges, we will make progress on another question: How unusual is life?